Penzion Kovarna has a six years tradition. The capacity of Pension is 4 double-rooms. Each room has own social settlement, wardrobe, LCD TV, refrigerator and Wi-Fi. During this six years we have listened to our guests and attempt to improve the quality of our services. Therefore, this year we were able to enlarge Pension and open a new part, which includes large lunchroom/ conference room and two wine cellars. The pension further offers outdoor pergola and private parking place. Thanks to the easy access from highway D1 you can find us qucikly. 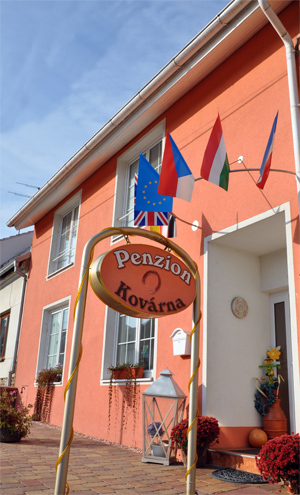 Pension is located very close to Brno centre, 5 minutes by car off the Brno trade fairs BVV and off Grand Prix. Next to Pension there is also public bus stop.